"Of course we should keep wearing leggings. Not because Maryann told us to stop, but because we like them, we like us, we’re TIRED and they’re COMFY." Female students address the leggings protests. Courtesy of the author. In case you missed it, we’re talking about whether or not leggings are pants… Again. I remember first hearing the debate during middle school, when the age of athleisure started to kick off. Every time we got “out of uniform day” at my Catholic school, we were reminded that leggings are not pants and that we would be sent home to change if we showed up in them. By the time I got to high school, it was finally acceptable to wear leggings as pants so long as we wore shirts that covered our “nether regions.” Once it was finally settled that girls wearing leggings to school wouldn’t send the boys into a hormonal frenzy, I thought that the debate was over. Leggings were pants. Yay. But then the debate followed me to college. 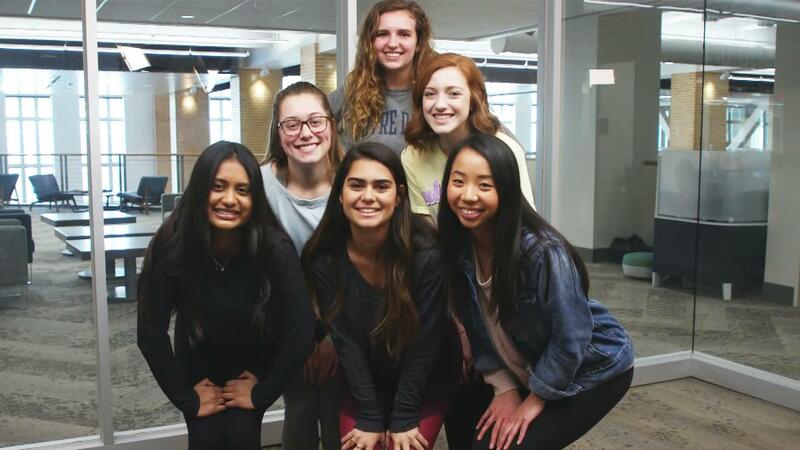 Last Monday, The Observer, our student newspaper, published a letter to the editor by a woman named Maryann White, who pleaded with Notre Dame’s female population to stop wearing leggings. “Leggings are so naked, so form-fitting, so exposing. Could you think of the mothers of sons the next time you go shopping and consider choosing jeans instead? Let Notre Dame girls be the first to turn their backs(ides) on leggings,” she said. Back in the good old days (read: 2008), skinny jeans were just as scandalous as leggings. The idea that denim would keep men “safe” from objectifying women is equal parts hilarious and concerning. The people who need to be kept safe in this scenario are women, but it’s clear that changing what we wear won’t make us any safer. Hi, this is 2019. Anyone who thinks that women are going to stop wearing a certain article of clothing so that men (and their mothers) will be happier is severely wrong. We’re just out here trying to get degrees so that we can become financially secure and don’t have to marry your sons for stability, Maryann. Sorry… I got carried away with the dated misogynistic arguments… but, anyway, leggings are comfortable and we’re BUSY so we like to be comfortable. The Princess Leia the slave girl analogy was weak. And confusing. But all I did was laugh. And send the article to my sister, along with a message that said “read if you want to laugh.” And I sort of assumed that most people would do the same thing because the argument that the article presented was incredibly unworthy of attention, But, within hours, I received Facebook invitations for three separate events calling on students (male and female) to wear leggings on Tuesday and Wednesday. And, of course, I participated. But I still wondered if there was more that we could be doing. In high school, I was outspokenly a feminist. I hung posters about gender equality in the hallways (and rehung them when the boys in my class tore them down). I went to the Commission on the Status of Women and debated about women’s rights in speech class. I wrote 99.9 percent of my college essays about women and pretty much every time I opened my mouth, something about equality came out. This might all seem like standard stuff, but in my extremely conservative Ohio high school I was an anomaly. Ask anyone who knows me now, and they’ll tell you I still haven’t stopped talking about girl power and women’s rights and toxic masculinity and social constructs and yeah, they’d be right. But, honestly, I feel like I don’t do enough. I’m really good at talking and I’m really good at wearing leggings but I could stand to improve my intersectionality. I could attend more events on campus and listen to the voices of women who feel systemic oppression more than I do. I could be a better ally to the LGBTQ+ community on campus. I could go to more protests and more marches and I could be less afraid to call out people I don’t know. I was talking to one of my friends the other day and was telling her that it almost feels like I’m shrinking. In high school, my ideology was so radically different that it was easy to be outspoken and to feel like I was making a change. But, here, it seems like we don’t talk about the real issues very often. We see an administration with outwardly problematic policies (like this and this) but we still spend a significant amount of time debating whether North or South dining hall is better. I don’t really want to shrink anymore, though, and I want to invite the students of Notre Dame to join me. Just because we live in a place with a Golden Dome does not mean that we’re too good to recognize the serious problems around us and take real actions against them. Maryann White is one person and her argument, even though it was full of toxic rhetoric and bad analogies (yeah, I’m talking about the Princess Leia one again), is one we’ve been hearing over and over. The leggings protests were a good start and I found it so empowering to see people rallying behind their love of athleisure and their bodies, but I hope the momentum doesn’t stop and that we keep up the conversation that Maryann started. I felt something happen when I talked to my friends about her article. It was like we weren’t talking about the leggings, but about what it means to be a woman and what it means to speak up… especially at a school where sexuality is governed by principles that lack modernity (see: this and this). The leggings are not the problem. The problem is not even the fact that Maryann has such a dated opinion and view of women’s responsibility to men (yes, this is a problem, but it’s not the one that I’m addressing now). The problem is that I read her article and the first thing it made me do was laugh. I have become so numb to oppressive thought that I wasn’t outraged. I didn’t feel immediately like I should start my own Facebook event (which is what I would have done in high school) and I didn’t immediately write a scathing response. By being in an environment where silence is incredibly easy, I was overtaken by my privilege and forgot the importance of my voice. Of course we should keep wearing leggings. Not because Maryann told us to stop, but because we like them. We like us. We’re tired and they’re comfy. But let’s not just wear the leggings. Let’s also spend a little more time recognizing the other issues that exist here and giving voice to them. Let’s try to be more vocal when we see things we disagree with and let’s be less afraid to say what we mean*. I think we’ll all be better for it. *I would like to take a second here to apologize for the continual use of the words “we” and “let’s”… I realize that I’m just projecting my problems on everyone else. But, if you have a similar feeling of shrinking and being quiet, join the club and let’s get LOUD. I am passionate about human rights (especially women's rights), education, and mental health awareness, so I will be writing on issues in those areas.